← Food Labels and Certifications: What Does it All Mean? I am all about making my life less confusing, which is why I love to sprout. Two years ago three things happened for me simultaneously: I read Animal, Vegetable, Miracle, the economy nosedived, and gas prices were very high. I started ranting about food miles, carbon footprints, and our budget. My husband, hoping to placate my rants, gave me a sprouter for my birthday. I was so enamored that I quickly bought two more. The reason I bought two more is because I wanted to be able to eat sprouts for my veggie bowl everyday. In order to have a constant supply I quickly learned the importance of staggering the growing of the seeds. Certain seeds take a long time (for example, I’ve found wheatgrass, sunflower, and broccoli take about 6-8 days to really be something). Certain seeds don’t (red clover, alfalfa, and radish take about 4-6). I am constantly washing out and starting new seeds to make sure my supply is fairly regular. My system of sprouting is extremely easy. I soak the seeds overnight in water. Dump them onto the sprouting tray and then rinse them morning and night. In a few days I eat them and start over. Some seeds my be duds and turn into mush instead of sprouting, in which case I dump the healthy ones out, clean out the duds, and put the healthy ones back in. That’s it. Easy as pie. It is possible to purchase lids to go on top of mason jars in order to sprout inside the jar. That option is the most economical, especially if you have wide-mouth jars around from canning! If you want to augment your “in case the world ends” shelves in the basement, you can purchase POUNDS of seeds and store them next to your water drums and hand-crank radio. Last but not least, what do you do with sprouts and how do they taste? I love the nutty flavor of sunflower sprouts stir-fried, in a salad, or eaten plain as a snack. Radish sprouts have a peppery bite that kicks you and is nice to put on a grilled cheese to cut through the fat. Alfalfa and red clover are very delicate and I only eat them raw. I find wheatgrass too stringy to eat in a salad, so that one goes directly into the juicer. While debate rages in the netherworld of potentialities, maybes, and “one day,” it is nice to know I can do something simple, nutritious, and delicious now. 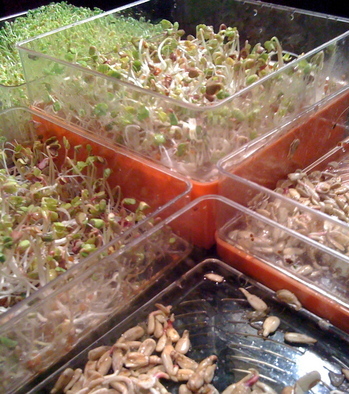 This entry was posted in On the Farm and tagged Corinna Borden, Raw Food, Real Time Farms, sprouting, Sprouts. Bookmark the permalink.